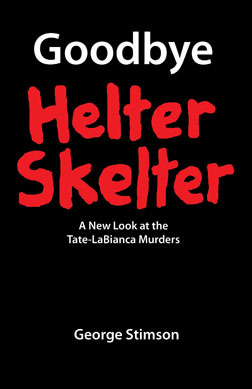 "Bugliosi proved Manson intended to remain there for 100 years by proving that Helter Skelter was the motive for the crimes"
I thought they were supposed to sojourn in the desert for 40 years, or 50 years, but not 100. Glad this was brought up because I was wondering about the current status of all things Chuck. 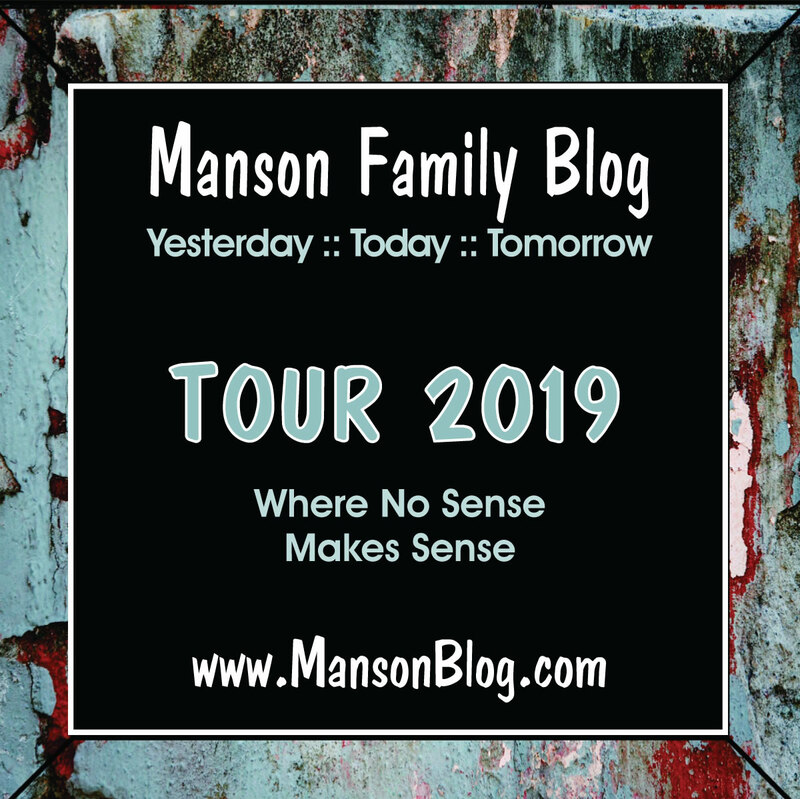 But a question I have for the legal gurus ... Manson wasn't at Barker for very long and I don't know if the ranch actually had an address. He seems to be passing through like a vagabond or tourist. The last place where he's not incarcerated, with an address, is Spahn Ranch where he seemed to be arguably more settled in as in clearly a resident. So does an address establish residency or just physically hanging out some place with dubious speculation over intended length of time or duration (domicile) ? This country is so scrambled with legalities and political correctness that a poor man can't even die without court drama. Geez! Charlie made it clear in his parole hearings that he had no intentions of leaving prison. In fact, I saw one hearing where they asked him his parole plans and he said he didn't think that was a good idea, and that he just wanted to be moved to general population. He also told his prison counselor that he didn't mind being in prison and that it was better than an old folks home. His intent was clearly to stay in prison. Can't they determine intent from his parole hearing statements? As for the wills, well it looks like Channels has the most valid one. It was also signed at Corcoran --King's County--Charlie's home in my opinion. I know the law doesn't work on people's opinions, but since he made it clear that he didn't want to go anywhere then it looks like his intent was to stay there. The man didn't even attend his last parole hearing. He wasn't interested in parole. I doubt Freeman is really Charlie's grandson. I doubt he knows who is bio dad really is. Nevertheless, it shouldn't matter in this case. I don't think even Charlie knew who really was his biologically. I doubt he even knew how many kids he really fathered. Why should it matter though? What did they do for him in the last years of his life? They didn't come around on Christmas and want to spend family time with him then. Why claim to be family now? Freeman claims to have good intentions, but he and his band of cameras appearing immediately after Charlie's death just didn't sit right with me. I'm glad I don't have to figure out the legalities of all this. It has become a mess. Your post was very informative though so thank you. I have been wondering what the problem really was with all of it. I mean, geez, the man has been stored in a freezer for 2 months. That part of the post wasn't supposed to be serious but use the absurdity of the HS motive to make an absurd point. That said: Van Houten said about 50 years. Kay in one interview said 50-100 years. Bugliosi said until the war was over and/or when the family had grown to 144,000 quoting Poston and Watkins. Robert C. said: "So does an address establish residency or just physically hanging out some place with dubious speculation over intended length of time or duration (domicile) ?" 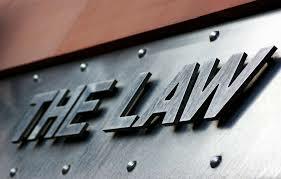 Residence versus domicile is one of those legal concepts that only lawyers could really care about. Put simply 'address' doesn't have anything to do with it although both may (and usually do) have an address. The distinction is 'intent'. Residence is objective- It is where you live. Domicile is subjective- it is your residence (where you live) combined with your intent to make it your permanent home. If Channels created the will by copying over a letter, then surely that will be noticeable if they look at the original he presents. I don't know the guy, nor do I have a dog in the fight. However, Freeman has nothing really, and the other will discussed here has no witnesses and the signature is questionable. It appears that Channels has more of a chance than anyone to win the fight. That doesn't mean I think he deserves to do so. I don't know the man so I have no way of understanding his true intentions. I am puzzled as to why the officials did not see this coming. Don't inmates have some kind of social worker to assist them with their personal affairs? They knew this man was dying. The prison pays for drs, dentists, psychologists, lawyers, etc... Surely they have some kind of social worker who helps inmates with this kind of stuff. I'm sure people with no family die in prison all the time. I know it shouldn't be the responsibility of the prison to take care of those things, but our darn taxes pay all that other stuff so why not pay for that too? I guess they don't though. I don't know bc I've never been to prison thank God. Smill said: "Don't inmates have some kind of social worker to assist them with their personal affairs? " The identified 'next of kin' can decline. Then the prison has a series of steps it goes through to find a next of kin if none is identified. Manson could have refused to identify a next of kin or sign the form and based upon where this currently sits, legally, I would speculate that is what he did. Prisons do not provide 'legal services' to help you write a will, why should they? Thanks for that info David. I figured they would have some type of procedure for that type thing, but I'm not knowledgeable about it. You are probably correct that Charlie just refused to sign their forms and assign a next of kin. I saw a parole clip of him where he said he refused to sign for his parole hearing paperwork bc he said people want to make money off his signature. I think he was paranoid of signing anything. Although preponderance is often described as 51% to mean more likely than not, I've never heard beyond a reasonable doubt equated to 99%. That seems like an unreasonably high burden and I don't think courts have ever been willing to quantify that standard. As for testamemtary intent, isn't that shown by the opening language in the document itself? When the document purports on its face to be a last will and testament that seems pretty clear. So, what was that show I thought I saw a few years back where they did a DNA test on Matthew Roberts against Jason Freeman? 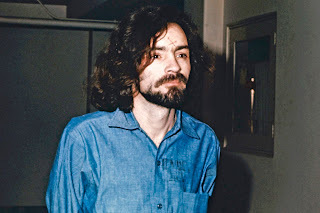 Is Matthew Roberts really Charles Manson's son or not? Why does he insist on telling everyone that? Shave off that goatee, buzz his hair short and remove that silly hat he wears and all you have is some guy telling everyone who will listen that he is the son of Charles Manson. He doesn't even look like Manson, without that costume he wears. He looks like an impersonator that you hire for corporate retreats, or parties. I find it sickening that all these people are coming out of the woodwork when Michael Channels befriended Manson before a lot of these other people came into the picture. Not only that, but think about the thousands of dollars he spent on phone calls each month, commissary for CM, postage, and going to the prison for visits? I think he had a genuine friendship with Manson, and those other people should back off. If they cared so much for Manson, they'd stop this bickering over his body & estate and let the man be buried or cremated. CNN did conduct a DNA test for Matthew Roberts and Jason Freeman. The DNA did not show alleles in common, no match. Roberts wants his DNA tested directly to Charlie's because he is suspicious that Freeman is not Charlie's biological grandson. Freeman's DNA has never been compared to Charlie's DNA to the best of my knowledge. I support some DNA testing to determine who really is or isn't related to Charlie but not on the taxpayers dime. Neither Freeman or Roberts ever personally met Manson because Manson never approved a visit for either of them. It says on page 1 that Manson and redacted (Channels) both signed page 2. 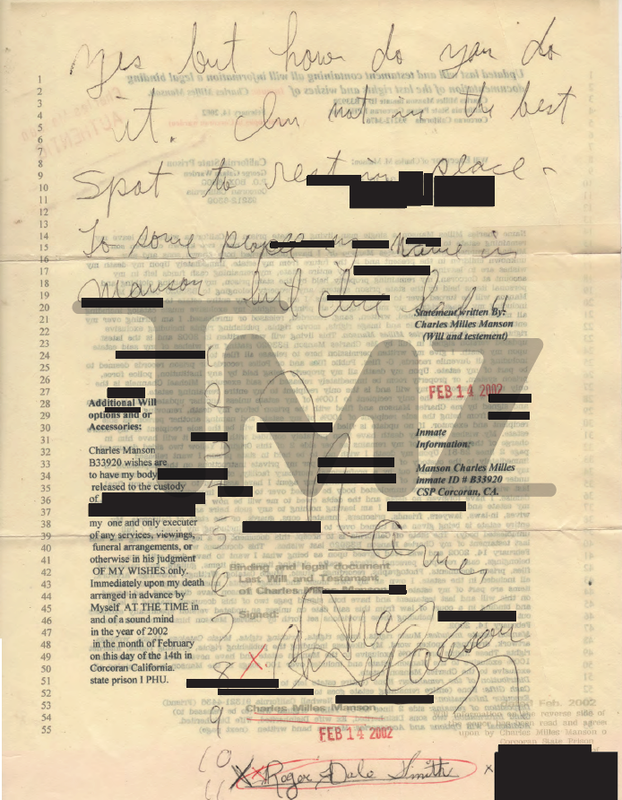 To the right of Roger Dale Smith's signature is a redacted portion which I assume contains Channels' signature as witness. If that is the case, doesn't that invalidate the will because Channels is both the executor and 100% beneficiary of the Manson estate? spot to rest in peace. Charles Manson", Manson vertically wrote the numbers "1 2 3 4 5 6 7 8 9 10 11”. Since Manson showed very little interest in his off-spring -- real or not -- I've always thought he would be perfectly happy to be interred in a prison graveyard with a number or perhaps cremated with a number in a jar on a shelf. I think that would be his intent. Regarding his stuff and any money, if it was a lot then I'd like to see it paid back to the taxpayers that paid for his lengthy incarceration or if it was little, donated to charity. I'd hate to see him embalmed and trucked around the country in a pay-for-view, or placed in a newly found church of chuck attracting new impressionable worshipers capable of justifying random murder in their heads. And I loved when Sandy BAZOOKA'D Nelson. Ziggy said: “If that is the case, doesn't that invalidate the will because Channels is both the executor and 100% beneficiary of the Manson estate? Of course, there is no direct answer: maybe. 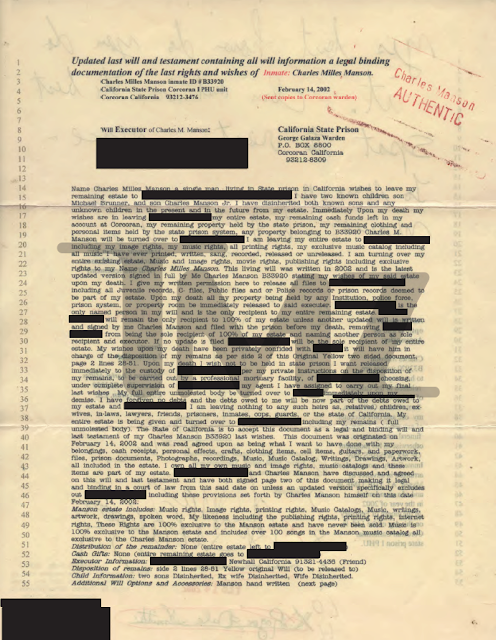 If that is Channel’s signature on the witness line and if he is (as we assume) listed under the blacked out places getting 100% he has a problem too. Channels will have the burden in (c) and that makes Mr. Smith a very important witness. IMO Manson's hand written bit, assuming Manson Mythos is not correct, might also cause problems. What does that question relate to? Resting in peace? Transferring his music? Getting his body out of Corcoran? Does it demonstrate anything about Manson's mental capacity at the time? In my experience hand written questions are not a good thing on legal documents. You know there is a possible outcome here that I am sure would not be what Manson had in mind. 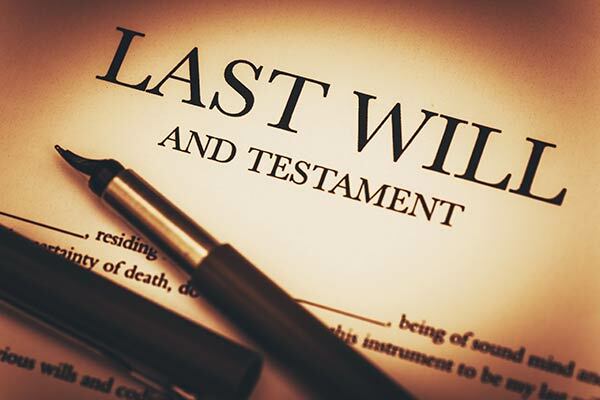 The potential problems with the two wills based upon the statutes could lead to them both being declared 'invalid'. The judge does not compare and say 'this one is more valid'. 1. If Manson did not file out a next of kin form when he arrived at Corcoran or any year after the state will deal with his remains. 2. 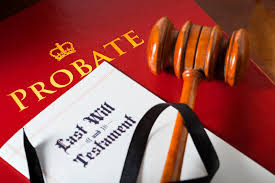 If both wills are declared invalid the State of California will receive his estate unless a bio- heir turns up. Manson going home after all, at least in court. Kinda sweet. David said: "You know there is a possible outcome here that I am sure would not be what Manson had in mind. The potential problems with the two wills based upon the statutes could lead to them both being declared 'invalid'. The judge does not compare and say 'this one is more valid'. 2. If both wills are declared invalid the State of California will receive his estate unless a bio- heir turns up." Basically the same I said above except I don't think Charlie would mind that. And unless something or someone shows up with the right papers, pedigree and all I think that's what's going to happen. Roger Dale Smith signatures. The top is from the will, the bottom from a letter. There is no function in any California correctional facility that performs like a "social worker" or whatever to provide help in managing an offenders personal affairs. Hell, the medical provided to most offenders is so bare bones, many inmates die from high BP related maladies and the like. If you perused all 50 states penal systems, I doubt you could one or a couple that have a social worker type on it's staff. If California were to provide something like that, the inmate population would soon swamp the "social worker" with requests for wills and other personal needs. It just isn't provided. I imagine that the jailhouse lawyers, prisoners who study up on the law, help out with wills and such. The form that the Channels will is on looks like something provided by the prison. Of course we can count on Charlie to play by his own rules when it comes to doing something like drawing up his will. I tend to agree with Robert C. I don't think either will should hold up in court. I just noticed that in our three-way effort on this post there is a bit of a confusion. The post says this: "Matthew Roberts... It is unknown if Charlie is really his father despite the fact that he does have a resemblance. However, Matthew was adopted as an infant so he has no legal claim to Charlie, in our opinion." It also says this: "A 'completed' adoption severs the right of a child to inherit from their biological parent unless that parent 'contractually' provides for it. In other words, leaves something in a will." I should have placed the second part near the first. To clarify: If Roberts was not specifically named in a will he would be cut off by the adoption. I hope that was clear but wasn't sure. My apologies to any who were confused. This is a great post with informative comments as well (as usual). I was getting ready to post a serious comment but after reading Cielo's, I'm laughing too hard. Watch how this plays out. Michael Burner has now also stepped up thru council and laid claim to his fathers remains. Superior Court documents indicate this as if Friday the 19th. Matthew’s will, will indeed prove to be a legally binding document and we will finial give this man a proper burial. "Matthew’s will, will indeed prove to be a legally binding document and we will finial give this man a proper burial." TMZ story from yesterday. It says pretty much the same as what has been said here. 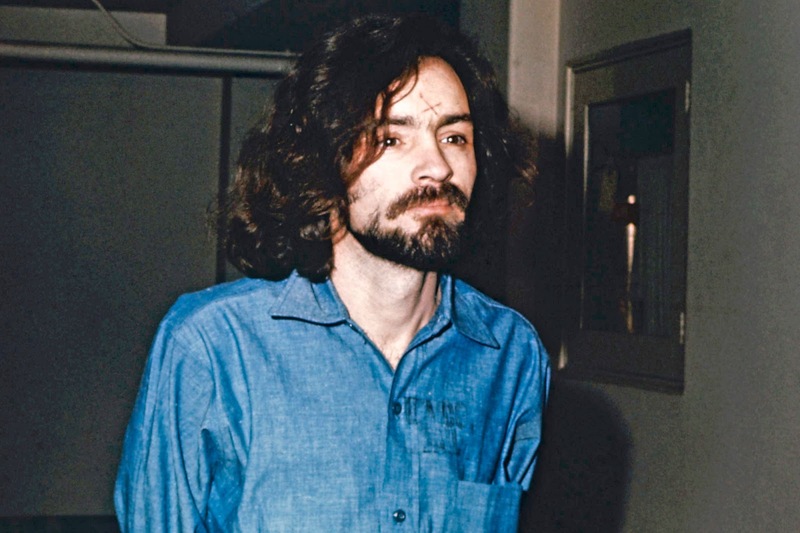 A judge has tossed the fight over the body of Charles Manson out of Los Angeles County. Judge David Cowan said Friday the case belongs either in Kings County, where the cult leader was imprisoned or Kern County, where he died in a hospital in November. Cowan says California law requires that the dispute belongs in the place where he had been living at the time of his death or where he died. Cowan says the battle over Manson's estate will take place in Los Angeles County because that's where he lived when he was convicted in the murders of pregnant actress Sharon Tate and eight others. Two possible heirs, a purported son and grandson, are seeking control of the estate, as is Manson's longtime pen pal, who claims to hold a will." "While the one previous hearing focused largely on procedure, the parties have lobbed insults and jabs outside court. 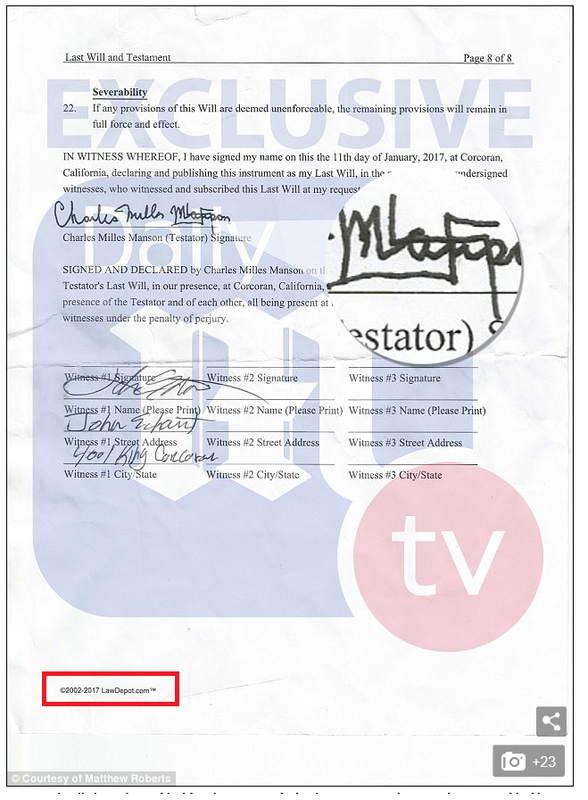 Channels said Lentz is a fraud and that Gurecki forged Manson's signature on the will he allegedly received in the mail in January 2017. Gurecki said the will that Channels holds was written by Channels and given to Manson to autograph during a prison visit. It was dated the same way Channels stamped Manson memorabilia he peddled. 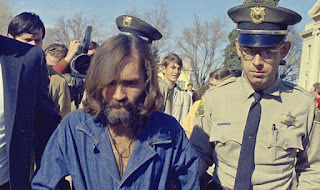 A spokesman for Lentz, Mike Smith, said he fears Channels and Freeman plan to profit off the body of Manson, possibly selling photos of the body to a tabloid. "We're going to expose both of them as charlatans," Smith said. Both wills could have significant problems of their own. Deputy Kern County Counsel Bryan Walters said the will Channels holds is partly illegible and appears to contain his own signature as one of two witnesses, which puts its validity into question because he's the beneficiary. Channels signature as a witness also appears to be dated four days before Manson's signature. "It's almost like 'Back to the Future,'" Walters said. "I think that story is probably going to unravel pretty quickly in court." The will naming Lentz as sole heir lacks a required signature from a second witness. Lentz could face a more significant hurdle beyond having to prove a genetic link to Manson. Because he was adopted, he can't make a claim to his biological father's estate under California law, said Davis, Freeman's attorney. "I don't think he's got a leg to stand on," Davis said." Been waiting for Michael Brunner to show up (ala Mary) which that link suggests. Michael states he'll cremate and privately dispose of Manson's remains. Fair 'nuff. But I'm guessing Mary wants the estate loot. Is Charlie’s son, needs a proper DNA test to compare against his father. The best situation here has happened. Michael Bruner has positively stepped up with his attorney and will now hopefully take care of his father and his estate. Michael Bruner is in my mind the ONLY person other then Matthew that will do the right thing by Charlie. The best news possible!! These two grandsons called Jay...The way it reads to me is that one is actually a son. What am I missing?